John Penley, former Secretary to Stinchcombe Hill Trust, kindly provided a copy of the conveyance for the sale of the land to Sir Stanley Tubbs in 1929. This includes a scale map based on the 25 inch OS Map of 1921. The conveyance reiterates the conditions of the Award and also states that the allotment “should be distinguished by metes and bounds but not fenced”. Metes and bounds is a legal term for a system of defining the boundaries of a piece of land in words, usually by reference to distances, bearings and natural or manmade features. 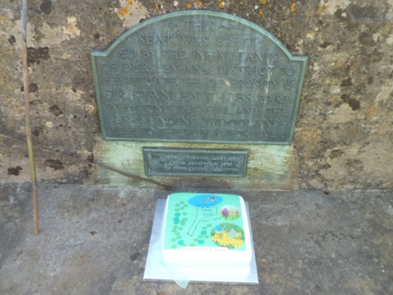 Several of the marker stones shown on the 1903 and 1925 OS Maps have been found, but despite hours of searching, most appear to be lost. 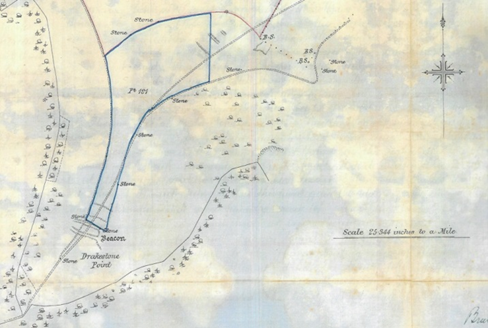 The Scottish National Library geo-referenced maps facility has been used to overlay Area 79b onto the 1903 25 inch map, with the Bing satellite map as an underlay. (This feature is not available for the 1921 edition.) The Village Green covers a considerably larger area than the flat, grassy triangle most of us associate with that name, with the north-eastern part extending onto the golf course. 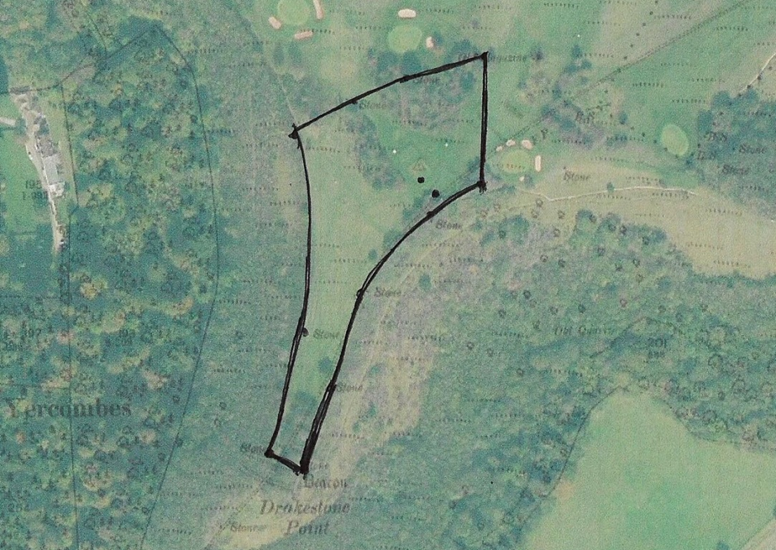 In 1903, the golf course had only 9 holes and its boundary, part of which is shown with a dotted line in the top right hand corner of the image, did not overlap with the Village Green. In order to raise awareness of the village green, a beating the bounds event was held on 6th May 2018. 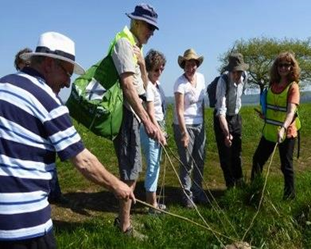 Beating the bounds is a centuries-old tradition that involves a group of people walking an important boundary and beating the boundary markers with sticks. The idea is that this helps fix the boundary in their memory. The custom exists in many different cultures and has been practised in Britain since pre-Roman times. Birch twigs were struck against boundary marks as part of the Celtic Beltane ritual, which coincided with May Day. The Romans daubed the foreheads of boys with goat blood before they paraded around the boundaries, whipping walls or trees with sticks. The Vikings had similar traditions, which became incorporated within Anglo-Saxon laws and customs. From Anglo-Saxon times, beating the bounds became a way of reinforcing charter rights to avoid disputes over land ownership. When church jurisdiction replaced that of the manorial estates in medieval times, beating the bounds became a Christian custom. It is associated with Rogation Days, periods of prayer and fasting, some of which replaced pagan Roman festivals. The priest would lead the congregation from the church around the parish boundaries, saying prayers or blessings at each boundary mark. Some aspects of the earlier pagan traditions, including the association with the start of summer and the beating of markers have survived. Celebrating with cake is our own innovation, as far as we know!